I am taking great strength from words these days. I have a chalkboard on my bathroom wall where I have written, "The cracks in your heart let the sun shine through". I feel slightly sheepish telling you that I read the quote in Oprah's magazine in an interview that she did with Ellen DeGeneres, and Ellen actually was quoting something that Diane Sawyer said to her. All three very strong successful women, so i'm not sure why the sheepishness is there. On my bulletin board beside my computer I have written the words, "GO. Where will you leave your footprints?, What marks are important?, Make the targets clear." These words came to me from Lori Koop's upword of the week email, which i gleefully open every Sunday morning. 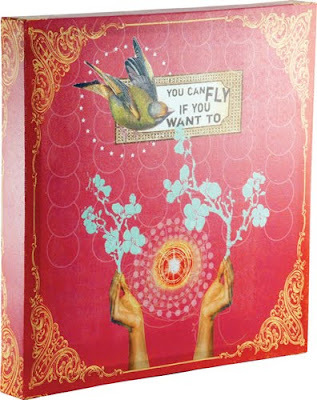 In my bedroom I have some new Papaya Art with the words "You can fly if you want to" and "fly". If I could own one of everything from Papaya Art I think I would know what bliss felt like. 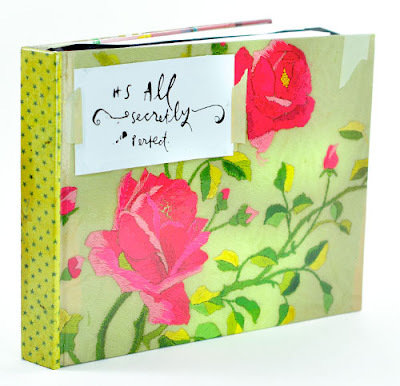 I am also madly in love with a sketchbook they do with the words "It's All Secretly Perfect" written on it. I believe that It's all secretly perfect....It has to be doesn't it?